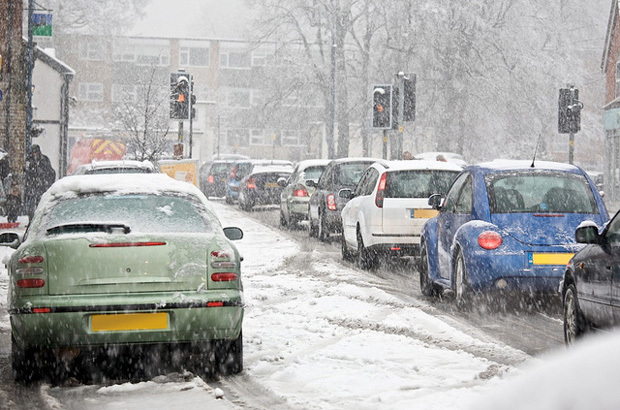 We understand that it’s frustrating for you and your pupil when we have to cancel driving tests because of bad weather; however, we only cancel if it’s absolutely essential. DVSA has a duty of care when conducting driving tests. When we consider whether or not to go ahead with testing, our main priority is to make sure that it’s safe to do so for the candidate, other road users along the route, and the examiner. We also want to give all candidates an equal chance to be assessed fairly, to prove they are capable of continuing to learn without further supervision. Letting them take their test in adverse weather conditions may disadvantage them. During the winter, driving examiners actively try to continue testing wherever possible. They’ll regularly go out and check the road conditions and will use those areas that are unaffected. They’ll also regularly monitor local weather forecasts and use this information to make informed local decisions. This means that although early morning tests may be cancelled, there’s still a chance the afternoon appointments may go ahead. Bad weather is snow joke! As you know, snowy weather presents its own challenges, from being snowed in to facing ice or slush on the roads. During snowy spells, examiners have to consider issues such as visibility of road markings and general road conditions of the local area. Again, this comes back to our duty of care and making sure we give the candidate a fair assessment of their ability to drive. They may also need to make some adjustments, for instance, offering to meet the candidate at a suitable location close to the test centre if the test centre car park is covered in snow. There are many ways that you and your pupils can get in touch with DVSA and stay up to date about whether or not driving tests are going ahead. If you’re familiar with and already using Twitter, you can search for updates about your local test centre by using their specific, individual hashtag. 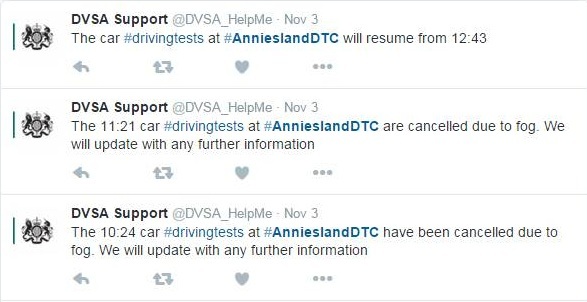 For example, #AnnieslandDTC is the hashtag for Glasgow Anniesland Driving Test Centre. DVSA’s customer support team are able to tweet updates within minutes of receiving them from the test centres, so you can be assured that the information is timely and accurate. If we have to cancel your pupil's test because of the weather, they won't be able to claim for any out-of-pocket expenses. However, we'll re-book the appointment for them at no further cost. Your pupil will usually get a new appointment date within 3 working days. This could take up to 7 days when the bad weather goes on for longer. The whole snow scenario is totally understandable. Snow and side roads are not a good combination for experienced drivers, never mind novice ones. What I don't understand is the cancelling of tests for bad mist/moderate fog (and we're not taking thick patchy fog). My pupils always use dipped headlights when the ignitions on; come rain, or shine. They certainly know where the rear fog light is. Also, they always keep 4 seconds behind traffic, so why not give them the opportunity to display these skills? The DVSA need to seriously re-think their strategy when it comes to cancelling tests due to fog. Your thoughts please? Hi Anthony, it's hard to generalise as every adverse weather situation has to be assessed on its own merits. We cancel tests only as a last resort and have to rely on the judgement of examiners and their managers, locally. The blogs are really helpful to myself and my pupils. Hi there, many thanks for your feedback, we're pleased to hear that these blogs are helpful. I completely agree that driving test should be cancelled when conditions dictate that it is not safe to be out driving. Having read the advice that the candidate should contact the test centre 2 hours before the appointed time I must draw attention to an incident that happened to me during the snows of January this year. My pupil had a test appointment and the ground was covered in 3 inches of snow. The sky was full of snow and it was snowing very heavily. I phoned my pupil and told him that his test would most certainly be cancelled due to weather conditions,and told him to ring the test centre for confirmation. This was 1 hour before the appointment. He rang and was told that no decision had been made yet and to ring back in 30 mins. That would only leave 30 mins to get to the test centre. Not enough time.I told him to ring again in 15 mins which he did but was told no decision had been made yet. Ridiculous!! . I now had to set off in hazardous weather to pick him up for a test that I was convinced would be cancelled. On the drive to ollect him the roads were treacherous and at one point the car was out of control and sliding sideways down a hill due to ice and snow on the ground. I was lucky not to have had an accident. I abandoned the journey as it was dangerous to be out driving and decided that if necessary I would have to pay for another test for my pupil. I rang to inform him and he told me that the test centre had just rang him to cancel. 20 mins before his test. This is not enough time. I would ask that when the examiners consider it unsafe for the test to go ahead then they ought to consider how the candidate is getting to the test centre and give adequate time to cancel without endangering pupil or instructor. Hi Jim, weather conditions can improve quickly as temperatures rise and we wouldn't want to cancel a test that could otherwise go ahead. Under these conditions, we would suggest contact is made nearer the scheduled test time. However, when conditions are such that the roads are unlikely to improve, then everybody would benefit from a decision made earlier/sooner. In the event that weather conditions at the test centre are favourable but the candidate's journey to the test centre would be difficult/unsafe, the candidate should write to DVSA’s corporate correspondence team at customer.services@dsa.gsi.gov.uk giving 2 of the following 3 identifiers: theory test number, driving licence number, practical test reference number. They should also give as much detail as possible about why they couldn't attend so that an assessment can be made regards whether to re-arrange the test at no extra charge. Hi - is there a handy list of test centre phone numbers somewhere? I've never needed to phone most of the 5 centres I use, but knowing their number could be handy. Check your test centre noticeboards if you haven't already. Ours have a list of local centre phone numbers and it's easy to take a snap of this with a smartphone. If yours doesn't have such a list, ask them to provide it - or at the very least get the number from the manager directly. Alternatively, ask your pupils to show you a copy of their test booking confirmation (if you book for them, it's even easier). The relevant number is provided on there.